Barrier Group Pty Ltd offers the Column Sentry, a range of high visibility column protectors designed to protect building columns against collisions from vehicles or mobile equipment. Suitable for use in indoor or outdoor environments, Column Sentry column protectors offer full protection to a company’s investments, facility, equipment and people. Column Sentry is ideal for parking garages, warehouses and factories. 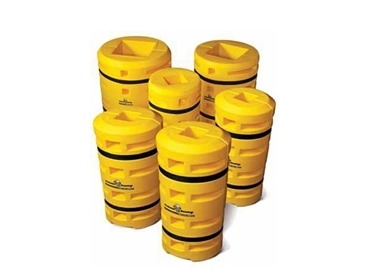 Moulded from high impact polyethylene in bright safety yellow finish with contrasting black straps and UV stabilised, Column Sentry absorbs impacts by surrounding the columns with a unique cushion of air. Column Sentry’s unique design can be used on square, round or ‘H’ pattern columns offering versatility and durability. The air vent system allows air to escape during impact, allowing the column protector to absorb impact and then return to its original form. Column Sentry column protectors can be installed or removed by a single person. The column protectors are available in a range of standard sizes that fit common column sizes.